Dr. Tom Barnes received a Bachelors of Science in Civil Engineering from the United States Military Academy at West Point, NY. After serving a tour as a combat arms officer with the 4th Infantry Division in Vietnam and five years on active duty serving his country he completed pre-dental training at the University of San Francisco and the University of California, Berkeley. He then attended the University of Alabama at Birmingham where he received his Doctorate of Dental Medicine Degree. As a senior, he received the award presented to the outstanding student in Oral Medicine. Upon graduating from dental school he served as a general dental officer at the Redstone Arsenal Dental Clinic. During this time he began private practice as the owner of Cullman Dental Arts and Associates. He remained active in the Alabama Army National Guard as a member of the 109th Evacuation Hospital in Birmingham, later serving as its Detachment Commander in Huntsville. After retiring from the Alabama National Guard, Dr. Barnes continued his private practice until late 2016. In 2017, he began serving the underserved nursing home and assisted living community in North Alabama with the Mobile Dental Clinic. Dr. Barnes has extensive post-graduate continuing education in orthodontics, cosmetic dentistry, oral conscious sedation, implant placement and restoration, sleep apnea, and other areas. 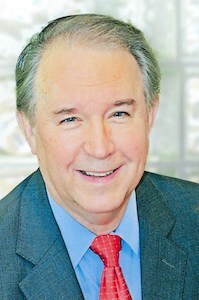 He is the former president of several dental groups and societies in Alabama. Dr. Barnes has also served his community in a variety of areas outside of dentistry from coaching soccer to creating foundations that benefit the brave men and women who have served our country as well as their families. His military certifications, awards and decorations include the Ranger Training, Airborne School, Nuclear Munitions Training, Purple Heart, Air Medal, two Bronze Stars, Meritorious Service Medal and the Army Commendation Medal. Now, with his great respect for the professional competence of Dr. Teichmiller and the different dynamics of each practitioner, they have decided to offer their combined services and capabilities to her already technically advanced but also highly personal, relational practice she has established here in Decatur. Dr. Tom Barnes is a Blue Cross Blue Shield Preferred Provider. He is available for Blue Cross Blue Shield PPO patients on Thursdays!